Harry N. Abrams, 9781419728495, 32pp. Matthew Cordell is the author-illustrator of many children’s books, including Wish, Dream, and, most recently, Wolf in the Snow. He lives outside of Chicago. "This picture book encourages girls to let the music inside them come out. 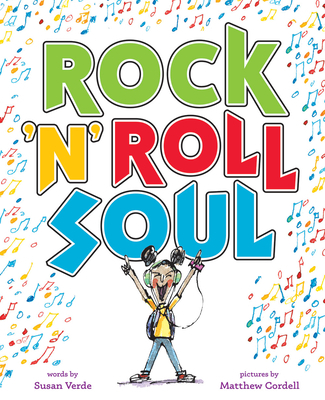 A rappa-tappin' good read that will invite readers young and old alike to move, groove, and turn on their favorite tunes." "Cordell (Wolf in the Snow), the 2018 Caldecott Medalist, never misses a beat. Whether capturing his uninhibited heroine bopping down the street to the music in her headphones or crunching her cereal in rhythm, his pictures are knowing and funny, and they crackle with visual electricity." "Cordell’s loose, sprawling artwork almost pours off the page—just as the music pours from the narrator’s head—and it’s well suited to Verde’s short, ebullient, and energetic rhyming text. Have materials for making sound on hand (the cruder the better) as this will unleash many rock ’n’ roll souls." "The pages are full of fun, abstract drawings featuring lots of color and detail."